Diane couldn't come to Berean yesterday, she had jury duty but we had a really good group of helpers today. 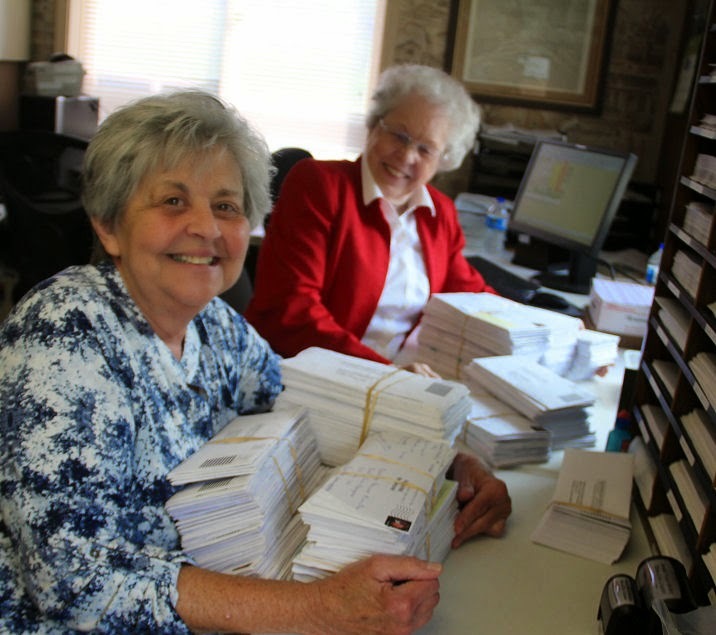 We had a bunch of mail, below Shirley and Eva Jean are fighting over who gets the bigger pile. We had a special gift from Akron Elevator in Glasford, IL. They sent a whole bag full of letter openers. 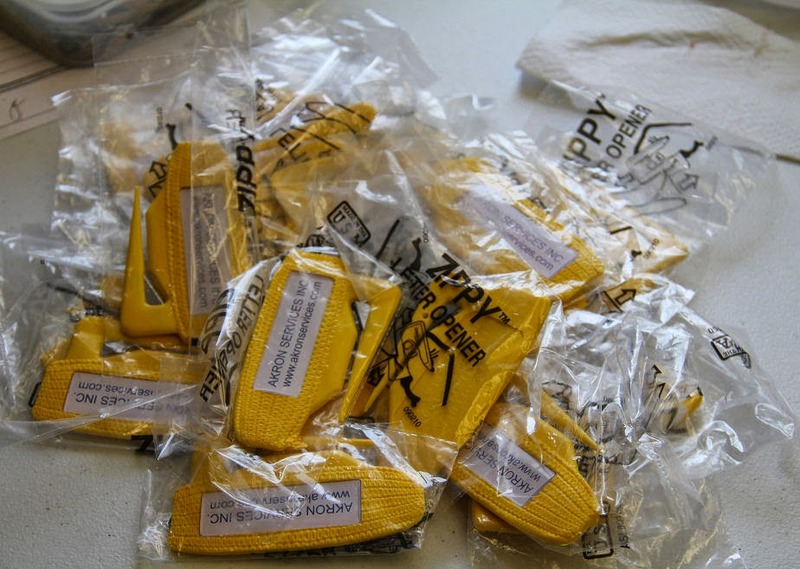 This was their second donation of them, These are so much better than any of our other ones that the volunteers were fighting over them. well maybe that is stretching the truth a little...but these are the first ones grabbed each time. Thanks Cheryl for this wonderful donation. Eva Jean and Shirley were a little worried at the beginning with Diane and Emily gone, they were thinking we were going to be working all day. Thankfully the door to the office started opening and workers started coming through. 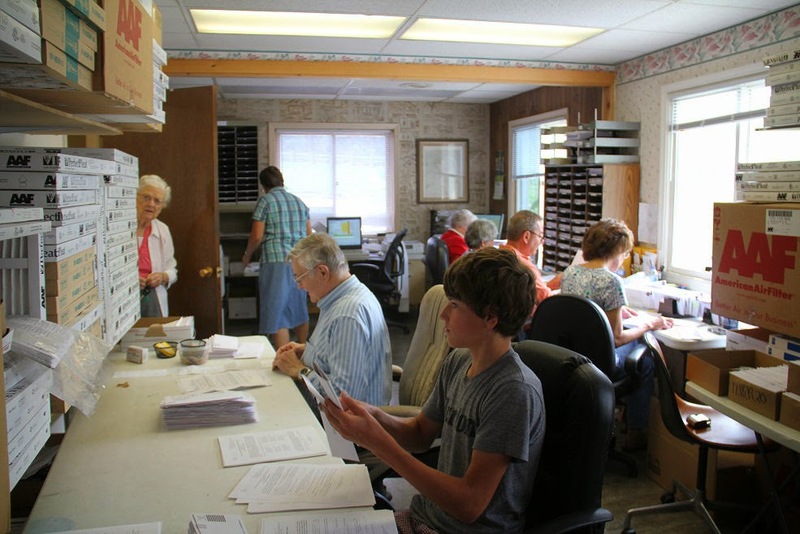 Below Aunt Bernie has just brought us 350 Bible stamps, Joan is running the copier, Eva Jean and Shirley are opening studies, Dave and Kathy are reading letters, chuck is applying labels to envelopes and Cody is stuffing envelopes. In the conference room Hannah is keeping her group busy with stamping envelopes, applying labels and sorting Bible studies. We had some pretty funny letters come in today. They will be scanned and posted on the Berean blog when I have a few extra minutes. One of our postage paid business reply envelopes came back with a note "that this is not going to work there is no sticker (stamp) on it." Another came addressed to King James % Berean Prison Ministry. Funny I thought that guy died years ago. One prisoner had a special request, "could I have one of those cool Bibles?" Another prisoner wrote: Could you donate us a basketball and a football? Just recently our basketball tore up and we never had a football. The prison does not buy us ball's! There's not to many things we can do, so we try to occupie our time in sports other then fighting. at the bottom of the page was NOTE: Not all prisoner's are bad people, we just made some mistakes in our lives that we have to correct and learn from. We were able to finish the studies and get all the letters read but were not able to get the Bible's entered. Hopefully I'll have a couple free hours today to get that done.